Emmy-nominated television show host, Padma Lakshmi visited Hyderabad, as a part of her multi-city book tour. In an interactive session, the former international supermodel and actress opened her heart out to the audience about her memoir, Love, Loss and What We Ate and discussed about various details of her life candidly from her relationships to her penchant for spicy Punjabi pickles from Delhi and how travel shaped her. ai?? ?There is nothing that reminds me of the home faster than the smell of frying mustard seeds and curry patta. I would always climb my grandmotherai??i? ?s pantry for the pickle jars that they kept on top of the shelves, away from my reach,ai??? she said during her chat with designer Shilpa Reddy. Her admirers stayed back after the talk, to get their books signed by the pop culture icon. It seems to be raining memoirs this week. 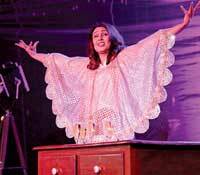 Former Bollywood actress and singer, Suchitra Krishnamoorthi, staged an adaptation of the memoir, ai?? ?Drama Queenai??i?? at Sheraton. Her performance was nuanced and she effectively managed to drive home several points about the kind of judgment a single woman face in this country. Meanwhile, Bai??i? ?town sweetheart Manisha Koirala was in town, for an interactive session hosted on World Cancer Day by FICCI FLO, Apollo Cancer Institutes and Cure Foundation at HICC Novotel. Koirala, who is a cancer survivor herself, touched upon the need of having a positive frame of mind. Also, Aamer Javeed, national secretary of National Studentsai??i?? Union of India, and wife Ruba hosted their son Arhaanai??i? ?s cradle ceremony at Windsor Garden, Begumpet. The guests were heard raving about the sumptuous spread of Nizami food and the mellifluous ghazals that added to the old world charm of the do. On the other hand, entrepreneurs Sonali Sharma along with Poonam Choudhuri from the Indian Heritage Lifestyle Store hosted a high tea at Taj Deccan before presenting a wide range of Hitkari potteries. The socialites were seen bonding over their love for fancy porcelain dining sets. Present at the do were socialites Bina Mehta and Shikha Sharma.